LAX Communica from the direciton of the campus pavillion. 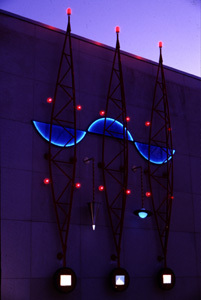 The primary elements of the work are the three radio towers with video portals and the illuminated sine wave. 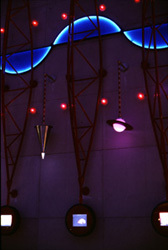 The empirical plumb bob and mystic Saturn are both illuminated while the planet is color shift animated at night. Detail of "Devices" and Video "Portals"
Materials: Powder coated and painted formed and welded Aluminum, Stainless Steel, Brass and Copper; Plastic and Glass Optics and Panels, Low Voltage LED arrays, Electronic Light Controllers, LCD Video Monitors, DVD Players, Radio Transmitter. Activity: Illuminated objects, Video Portals and Radio Transmission; Modulating Color Saturn. 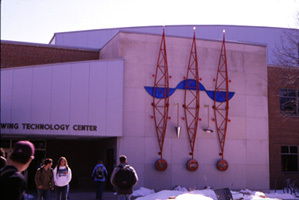 The work for the Wing Technology Center is a marker for the activities that take place within the space: the seeking and extending of current and future technologies, communication, and expression. We envisioned the work as an expression of our fascination with technology and as a portal for the students and artists that live within the space. It is physical and static yet broadcasts information. The solid elements of the work reflect technological icons: space frames, communication towers, archetypical devices, objects of mystery; and serve as hosts to the ephemeral dimension of light. Implying devices of communication the illuminated objects, in the form of glowing lenses, light phasing suspended objects, and laser beacons, will actually serve up communication. 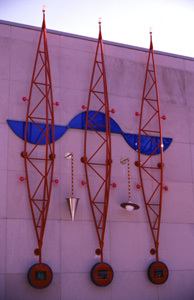 Incorporated into the piece are three viewing portals that are active both day and night. These portals enclose LCD video monitors that play motion media works from DVD players within the building. The sound from the three individual DVD players will be transmitted by short range FM transmitters to anyone that desires to listen (and has an FM radio). At night the frenetic glow of the video screens can been seen from across the campus as changing fields of light and, on a misty eve, the lasers punching out overhead. 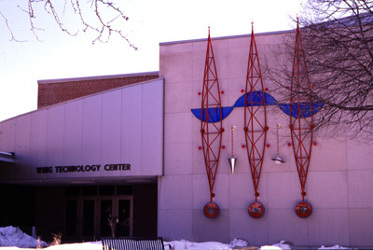 The pace of the centers environment and the reach of communications. While the initial motion media came from us the students were ready to present their motion graphic works or video pieces through our work. From creating works for the object, to simply presenting projects they have completed, the intent is to let the installation reveal the activities and works that are generated within the center. The piece not only ÒmarksÓ the environment but transmit its energy and purpose. It is a stopping point for the passerby and an gathering spot for viewing. And the work puts the students reflections out there for all to see.